When is social search coming? What? It's here? Search Engine Guide > Mike Moran > When is social search coming? What? It's here? Not long ago, there was a lot of discussion about whether Facebook was taking over the hearts and minds of the next generation, where Google has owned the previous one. Much discussion ensued about whether using a search engine to find things would be easier than asking your friends. As usual, the future is more complex than we imagine, because we have all decided that the answer between text search and social networking is...both. It reminds me a lot of the debates of the 1980s (OK, I am old) about whether hypertext or search was the right way for users (that's what we called them) to find information. What do you think was the outcome of that? Yeah, both. So, as Facebook experiments with features that people think might be the new SEO, and as Google files patents that tries to take away the human expert advantage of Facebook, a more interesting set of developments are underway in the search engines themselves. Microsoft made a deal with Facebook to help search results rankings based on what your friends think. Both Google and Microsoft publicly acknowledge that they use Facebook and Twitter in their ranking algorithms now. Google admitting changing its algorithm to downgrade sites with bad reviews. So, the big question is: What are you waiting for? If you were the kind of person who waited for Universal Search before you started making videos, I have a message for you. It's time to pay attention to social. Now, I am not that kind of person. I usually start working with something as soon as I see that it has value, if only just to experiment. So, I've been in social media for years. But I do understand the other point of view, that you should wait to see if something has value before jumping into it. I admit that some of my experiments haven't worked. So, if you've been skeptical that social media had value, that's fine. But if you spent all your walking hours staring down your search results, trying to attract more links, tweaking your titles, and otherwise obsessing about how to wring a little more Pagerank out of the Google Gods, and you're STILL wondering whether social has value...STOP WONDERING. Links have value all by themselves, but they have more value because they are a signal to search engines that the pages they link to are of high quality. Social media activity is starting to perform that same function, not instead of links, but in addition to links. If your strategy has been to buy links or to manipulate links, now you have to manipulate social media activity, too, because Microsoft and Google are checking your homework to see if you've been cheating. 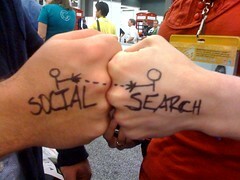 Social search is here. What are you doing about it? "I don't have time for Facebook and Twitter"
I don't know that search on sites like Facebook is the end-all, be-all for marketing. People will always use Google first as long as those search fields are built into the browsers themselves. Where I think Facebook is most useful is for getting likes so that peoples friends can see about different businesses. Marketing services like GetMorePopular can definitely help you out with this. I do think it will be interesting if Facebook continues to invest more in search and I think thats where Facebook's relationship with Microsoft and Bing might come into play. I do belive that social media has value. I have been trying to get into twitter and facebook as part of my SEO strategy. I find it to be incredibly time consuming, and I have pretty much let it go for the time being. The time invested wasn't worth the results. Hi Mike - thanks for your book btw Search Engine Marketing, Inc. The original got me hooked, helped turn me into a full time SEO at a big box company for a couple years, and I recommended it to many along the way. I use Facebook and LinkedIn to make it easy for friends and businesses to find me. And I experimented with Twitter but found it too irritating to integrate into my regular routine. A good SEO friend of mine invested a big part of his time over the last 3 years into social media research and experimentation and I hope it pays off. He gets floods of traffic in a short amount of time but I think most of it is drive by and not qualified traffic. I hear what your saying and I'm trying, but I'm dreading the day I have to beef up posting or adding "friends" on Facebook to get a higher ranking on a Google local map for an attorney or cosmetic surgeon. On phrases where a dozen SEO companies are fighting for position I can see it already integrated in the overall strategy. The more I read, the more exhausted I get. I really didn't want to make the transition. Dealing with Google is difficult enough. But alas, I guess I am going to have to figure out Le Face and La Tweet. Of course the social media websites have value. They have high PR. If you can get more people link to your site from facebook that will help. But any other high PR sites will work just fine. And there is older generation that is not to big on social media. May be in 10 years from now when all kids who are currently using face book grow up, google algorithm will dramatically change to keep up with younger generation. But I do not believe any major changes in algorithm are coming any time soon.